Inspire your special recipient to go after their dreams and have them know that you are supporting them every step of the way! A bold punch of color, this stunning fresh flower bouquet brings together the swirl of orange roses and pairs them with the star-shaped petals of orange LA Hybrid Lilies, accented with white mini carnations, green button poms, peach hypericum berries, and lush greens. 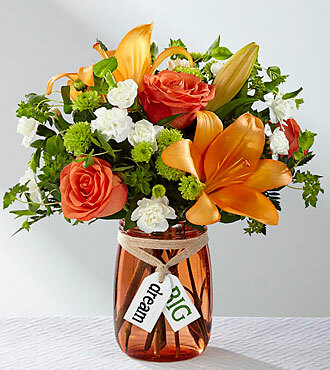 Presented in an orange glass vase tied with special wooden tags that read, Dream Big, around the neck, this flower arrangement is set to create a memorable thinking of you, graduation, or inspirational gift.